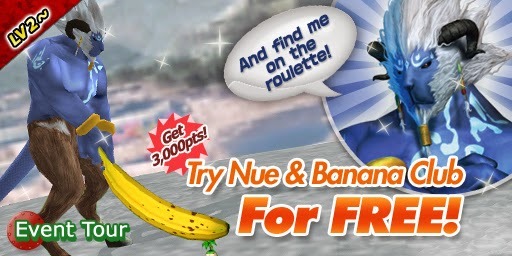 Why don't you try Nue and Banana Club for FREE? Everyone from level 2 can try it! you will see Nue on the roulette! The winner's prize is Big Banana Club Set. All birdie prize is 3 Bound Balls. Just join and finish this easy tour to get Mulligan (1 day)! The winner's prize is Muramasa's Club Set. All birdie prize is 1 Mulligan (1 day).